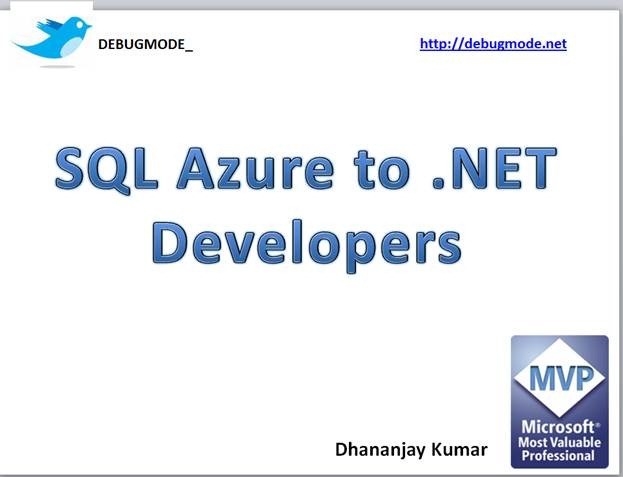 I presented on the topic “SQL Azure to .Net Developer”. Although my session was last session at 4.30 PM, I had more than 40 participants. Since my session was last for the day, I had been thinking to interesting and out of the box start. I started session with most popular 30 second video “DEVELOPER DEVELOPER DEVELOPER “. After seeing this video crowd was set for the session. I set the expectation to the audience that session would be DEMO and CODE oriented. 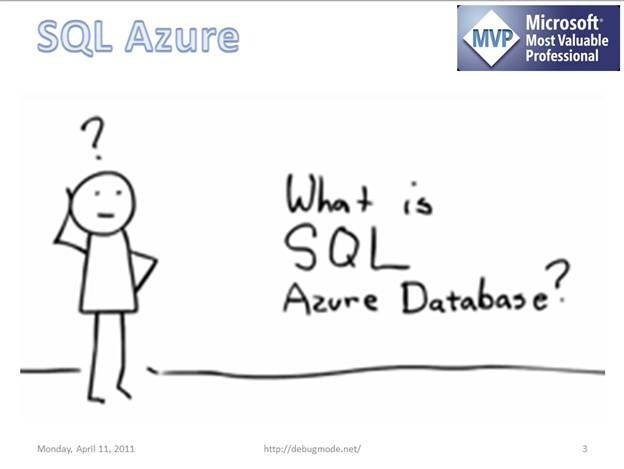 My first slide left the audience with a smile because I did not directly answer the question “What is SQL Azure Database? “ And I told them there are About 5,480,000 results (0.11 seconds) on the Google so there is no need for me to preach on this, just let us start coding. 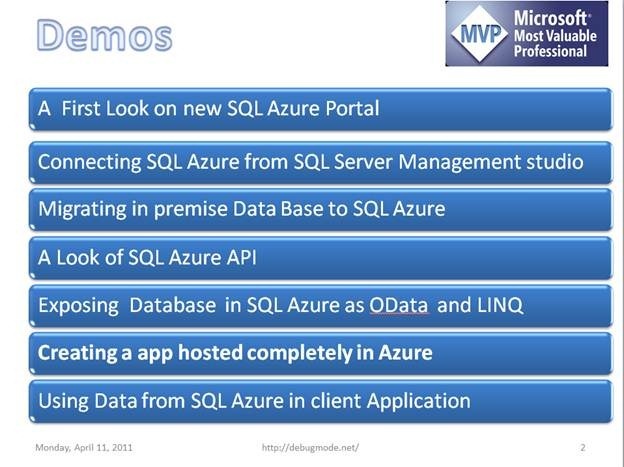 I started with a look on new SQL Azure portal. And I gave demo on the below topics. It was fun for next 55 minutes. I enjoyed writing code in front of more than 40 people. Audience got really excited when they saw a web application completely created and hosted before their eyes in the azure. I conclude here with saying, it was a nice learning and motivating experience for me delivering at Pune Azure Boot Camp. Developer ! Developer ! Developer ! Me and My friends Whom i forced to attend for first time told me its worth giving whole Saturday after weekdays hectic schedule . They enjoyed a lot . Also like to thanks for all topics covered by Mayur , Aviraj and others .